"This is a huge opportunity for me. We have a talented squad and I am looking forward to working with the players and staff." Former Scotland international Hopkin had a short spell as a player with the Bantams during the 2000-01 season and remains their record signing, having joined the club from Leeds for £2.5m. After beginning his career with Greenock Morton, the midfielder also played for Chelsea and Crystal Palace before his retirement in 2003. "The club is ambitious and so am I. Although my time as a player here was cut short by injury, I enjoyed my stay and took away some great memories," he continued. 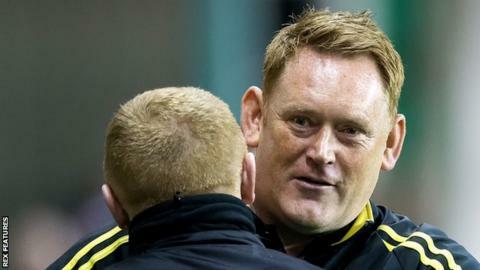 Collins, 32, had been the youngest boss in English professional football and was in his first senior post, having been promoted from his role as the club's under-18s manager in June. Stuart McCall was sacked in February after overseeing six successive losses before Simon Grayson left the club at the end of the season when his contract expired.